US Recession Talk Silenced: Time To Buy? The March jobs report in the US revealed 196,000 newly-created positions when economists expected 175,000. This was a much better result than February’s lousy 20,000 figure, which was revised up to 33,000. Importantly, it cooled down the hothead pessimists who have been praying for a recession. And bond yields rose reducing the fears about an inverted yield curve. Optimism on the economy showed itself on the New York Stock Exchange, with materials and financials stocks surging, which has to be good for our market. These two groups account for 50.6% of the S&P/ASX 200 Index. Materials ended up 4.3% for the week in the USA, while financials put on 3.3% as their share prices responded to the prospect of rising rather than falling interest rates. Morgan Stanley rose over 6% this week, while Goldman Sachs, Bank of America and Citigroup had better than 5% gains. Of course, we have to contend with this damn election in May and it could easily take the gloss off optimism that we should be using to take stocks higher right now. On top of that general optimism obstacle for stocks, there are the specific concerns that Bill Shorten and Chris Bowen aren’t really articulating policies that seem supportive of investors, especially retiree ones, stock markets and the big end of town. More on our stocks outlook later. Let’s see what Wall Street and overseas forces are set to send down the stock market pike over the next few months. But before this, let’s see what happened to US stocks over the past five years. 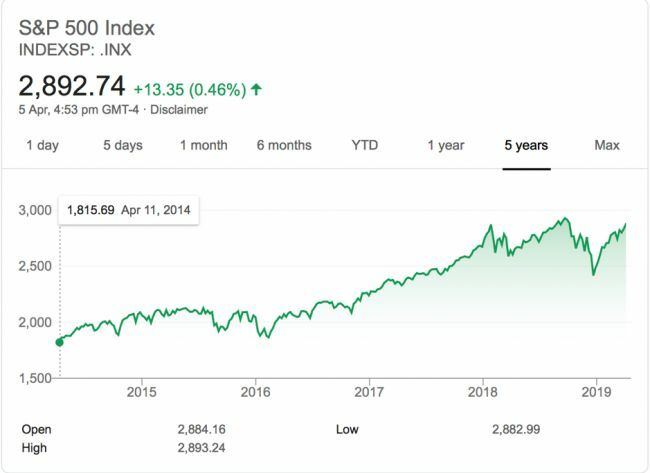 The chart of the S&P 500 Index shows it has spurted higher from 2016. It started before the November win in the US elections by Donald Trump because the US economy had started to recover and show that super low interest rates around 0% and lots of bond-buying by the Fed giving cheap money to business and consumers actually produces economic growth. Early Trumponomics and especially his tax cuts propelled the economy and stock markets higher but too good growth led to the Fed getting too enthusiastic about interest rises, just as the Trump tariffs on China and elsewhere, along with trade war threats hurt global growth and stock prices. The big dip in the graph below in late 2018 was the consequence. Now many of these negatives are turning positive. The Fed has opted for “patience” on rates. A trade deal agreement is expected sooner rather than later. China is stimulating and the economy seems to be responding and the EU is in stimulation mode as well, providing cheap money to banks for lending purposes. And the jobs report seems to be saying that if a recession is coming, it’s still a way off yet. Economic readings will remain important and the market didn’t miss the weaker services sector reading for last week. This is how Trading Economics saw it: “The ISM Non-Manufacturing PMI index for the United States slumped to 56.1 in March of 2019 from 59.7 in February, below market expectations of 58. The reading pointed to the weakest expansion in the services sector since August of 2017, amid a slowdown in production and new orders. “Respondents remain mostly optimistic about overall business conditions and the economy but concerns remain about employment resources and capacity constraints.” By the way, any number over 50 means the sector is still expanding but just at a slower rate. The next hurdle for US stocks will be reporting season and the analysts’ guesses aren’t all that positive and it happens with share market indexes about 2% off all-time highs, which makes me a little nervous. That said, I expect improving economic readings along with positive vibes from a China-US trade deal will help stocks. And while it looks like we will see the worst US earnings season in three years, many experts think this could be the low before profits rebound. It makes CEO outlook statements really important and a trade deal is bound to deliver both certainty and clarity on opportunities for those trying to guess their companies’ fortunes. This week J.P.Morgan and Wells Fargo report, the Fed minutes, inflation data and Brexit-EU announcements will influence stocks but it’s the outlook statements that will help or hurt stocks. The jobs report gave stocks a boost and now we need to believe that profits can rebound. The mob that makes a business out of guessing US company profits has the first quarter down 2.2% followed by a rise of 2.8% in the second quarter and a 9% surge in the fourth quarter. If these guys are right, it’s a boost for stocks on the way. Numbers man, Sam Stovall, who used to work for Standard & Poor’s when I interviewed him a few years ago in New York for my TV show, is now chief investment strategist at CFRA. He told CNBC that’s what’s showing up in his crystal ball: “I think maybe we end up getting to a new high sometime early in the second quarter, and then maybe we do some sideways moving in that ‘sell in May’ period. So that means just when our election is over and there could be a relief, “thank God the poll is behind us” rally, Wall Street could be due for a damn pullback! So could we resist the lead from Wall Street? Well, on one hand, a likely Labor victory could frighten investors but it would probably be factored in by the market before we vote. And then there could be a rush to buy stocks and property before January 1 next year, when negative gearing laws change and the capital gains discount goes from 50% to 25%. If the rest of the year scenario for US earnings, economics and stocks is right and China’s stimulus program continues to work, then along with “the kill Bill effect” on investing after January 1, I suspect our market can have a good year for stocks. To date, we’re up 11%, so a pullback followed by a bounce back is my best guess. And that’s how I’ll be playing it until the facts change, which of course I’ll be on the lookout for 24/7. Peter Switzer is the founder and publisher of the Switzer Super Report, a newsletter and website that offers advice, information and education to help you grow your DIY super. Content included in this article is not by association the view of FNArena (see our disclaimer).